This article was originally displayed on B&H Photo Video. To read it there click here. Back by popular demand, Gura Gear has revived the Kiboko line. Three Kiboko 2.0 bags hit the shelves this November, offering many of the features photographers know and remember from the originals, plus a few key updates. Here’s what you can expect from the highly anticipated Gura Gear Kiboko 2.0 lineup (and a look into the also-new Et Cetera cases). The new Kibokos offer a structured, water-resistant nylon interior with a streamlined profile, and each is available in understated black. The trio has a few core things in common. Each bag utilizes the patented dual-sided, butterfly-open design made famous in the original line. This is a key factor in the bag’s intended purpose: Photographers shooting in the elements only have to open one side of the bag at a time, protecting half their gear from the outdoor conditions. As a secondary design feature, there’s no large lid to swing open. For photographers who are anywhere where space is tight—whether on a boat, in a safari vehicle, or packed shoulder-to-shoulder at an event—this is a minor detail that can make a big difference. On the subject of minor details that make a big difference, Gura Gear took customer feedback into account after hearing that the waterproof zippers in older Kiboko models were hard to pull. Those have been replaced with a water-resistant zipper that’s smoother and is easy to grip, even when tested with bulky gloves. Gura Gear also honored customer’s wishes to replace the previous Dyneema exterior with an ultra-tough Dimension Polyant VX-21 sailcloth. Sailcloth is meant to take an absolute beating in the elements, and it feels as durable as it's billed to be. Another small but interesting feature is a strip of neon blue binding tape visible around the interior zipper seam. This isn’t just an aesthetic choice, it’s a functional one: If you can see blue peeking out, it means your pack isn’t zipped all the way. Any photographer who’s ever moved too quickly without realizing their bag was still open knows the value of a tiny, yet effective failsafe like this. All three bags also come with a rain cover (and its own hidden pocket), exterior zippered pouches for accessories and cords, and a generous supply of extra storage dividers. All packs are incredibly lightweight, considering their capacity. When empty, each of the three weighs less than 4 lb. The baby of the group, the 16L, is brand new to the Kiboko line. Measuring nearly a foot wide, 16.5" tall, and 5.5" deep, this compact backpack is perfect for those of smaller stature. It can hold two mirrorless camera bodies (without battery grips attached) and a decent assortment of lenses. You’d struggle to fit a massive telephoto in here, but something like a 70-200mm can fit with some careful arranging. There’s also a back-facing zippered pouch that can hold an iPad Pro or 13" MacBook Pro (2018 model tested). When you have a tablet or laptop in the back compartment, the bag’s interior storage dividers fold at the bottom to accommodate the added bulk. It’s another neat design feature that showcases the thought that was devoted to these bags. The 22L is one of the classic Kiboko sizes and meets us in the middle, at more than 13.4" wide, 18" tall, and just about 6" deep. It can hold a couple of DSLRs, such as a Nikon D850 or Canon 5D Mark IV, without grips attached. Or, it can store a couple of mirrorless bodies with battery grips. 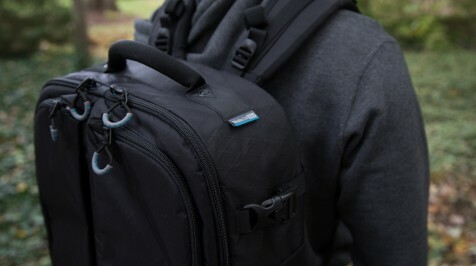 Like the 16L, there is plenty of storage for most standard lenses, and room for a 15" laptop in the rear-facing pouch. This bag also comes with the dividers that fold for laptop bulk, and the thick padding on the back—which all the bags have—goes a long way in being comfortable to wear. It’s also nice having the laptop compartment resting against the wearer’s back, which better distributes weight for balance. The 22L comes with a padded waist buckle for added support. The largest of the three, the 30L, was another mainstay of the original Kiboko line. At 12.5" wide, 20.4" long, and 6.7" deep, its design has the primary goal of making life easier on travel photographers lugging gear aboard airplanes and out on location. 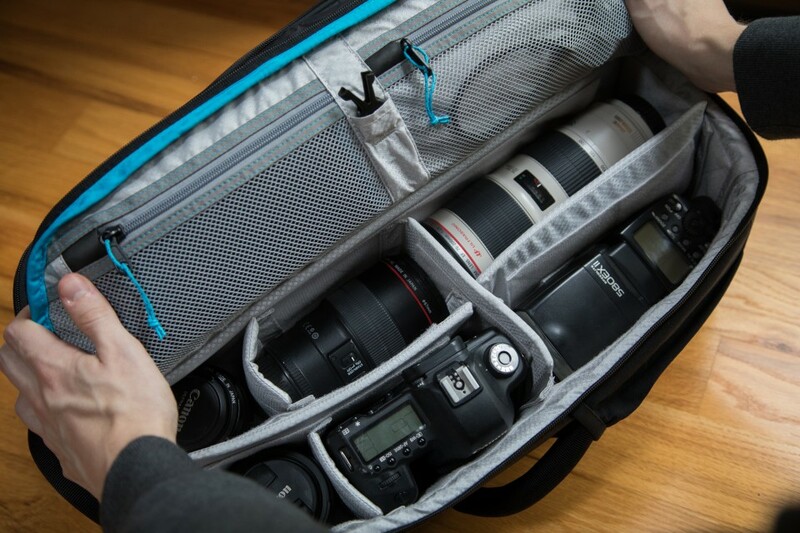 The 30L can accommodate multiple pro DSLR camera bodies (with grips) and has enough room for large telephoto lenses. The bag dedicates every inch of available space to holding as much equipment as you can comfortably fit while staying within the size requirements for storing in an overhead bin. The bag’s straps (shoulder and waist) stow away into a zippered enclosure on the back so it stays nice and compact on a plane, and an ergonomic handle on the side helps you hoist the 30L up and down from overhead. Since the priority was fitting as much gear as possible, frequent fliers should note the 30L+ intentionally leaves out bulky extras like wheels, a telescopic handle, or a laptop compartment. Launching alongside the three new Kibokos is a collection of small lightweight cases. The Gura Gear Et Cetera line comes in five sizes to cover your every accessory storage need: XS, S, M, 1L, and 2L. 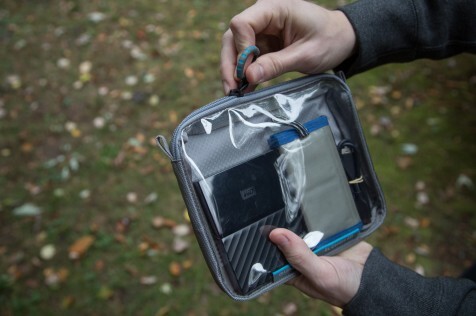 Available in gray nylon, each Et Cetera piece comes with a clear, eco-friendly (and REACH-compliant) plastic window that lets you see your cables, batteries, chargers, headphones, or whatever else you’re carrying. The XS, S, and M are standard pouch-style zippered cases, while the 2-inch-deep 1L and 2L offer a little more structure and organization. The 4 x 8" 1L has three interior elastic slots that are perfectly sized to hold three CF memory cards. Its larger sibling, the 8 x 8" 2L, comes with two removable storage dividers. Both the 1L and 2L have a handle and exterior plastic slot for a label. While not intended to be modular components, each of the Et Ceteras would store nicely in the spare room in your Kiboko.